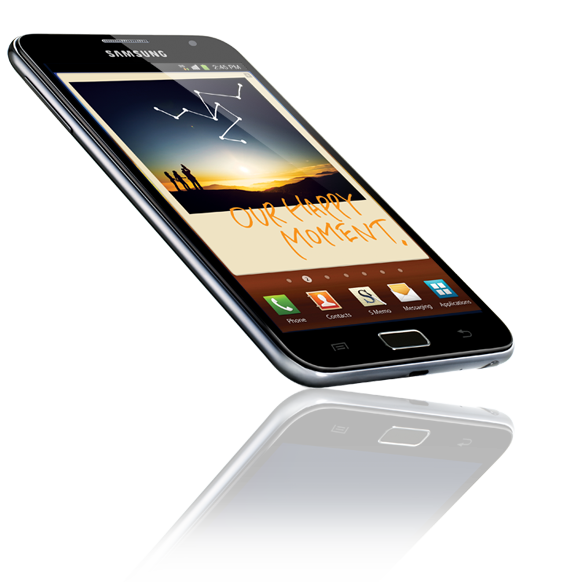 Samsung's behemoth Galaxy Note will be released in the UK on November 17th. Samsung's tablet/smartphone hybrid is packing a 1.4GHz Dual Core processor (thought to be from the Exynos range) and comes with special stylus input support. The HD Super AMOLED 5.3" display has a resolution of 1280x800 with 285 PPI. The phone also has and 8MP camera on the back with LED Flash, capable of recording at Full HD 1080p and a 2MP front facing camera for video chats. Expect this bad boy to cost quite a bit though, with the cheapest online retailers asking for Â£575.99 for the 16GB version. It will likely be available at a cheaper price on contract at most major networks in the UK. Skip past the break for Samsung UK's press release and a link to the spec sheet. UK LAUNCH DATE ANNOUNCED FOR SAMSUNG GALAXY NOTE New Android mobile device to hit UK shops in Mid-November 3rd October 2011, London, UK â€“ Following the recent global launch at IFA, Samsung has today announced that the latest device to join its Galaxy range, the Galaxy Note, will be available in the UK on 17th November 2011. Simon Stanford, Managing Director, Mobile, Samsung UK and Ireland said: â€œWeâ€™re delighted with the overwhelming reception the Galaxy Note has received since it was announced earlier this month and are looking forward to offering Samsung customers a whole new smartphone experience. The Galaxy Note is a great example of Samsungâ€™s passion for innovation by bringing to market a brand new category of mobile products. It is our fastest handset to date and brings together all the benefits of our award-winning smartphone technology and services.â€ The Galaxy Note combines the benefits of a notebook with the portability of a smartphone. Thanks to its 5.3â€ HD Super AMOLED screen, the largest, highest quality display available in any phone, consumers can view movies, photos, and documents, as well as play games on the device with crystal-clear clarity. Not only that, an advanced pen-input technology called the S Pen and a full touch screen mean owners of the Galaxy Note can easily create and consume more content whilst on the go, with minimum scrolling and screen transitions. With a 1.4GHz dual-core processor, the Galaxy Note is Samsungâ€™s fastest handset to date, combined with HSPA+ enabled super-fast connection means thereâ€™s immediate access to content and increased download speeds for streaming videos in real-time or chatting with friends online. The Samsung Galaxy Note will be available in the UK across major networks, key high street and out of town electrical retailers and online. For full specs click here!